Jeff Koons’ sculptures sell for millions of dollars. In November 2013, Balloon Dog (Orange) was auctioned off at Christie’s in New York for US$58.4 million, the highest price ever paid for an artwork by a living artist. In addition to having had many solo exhibitions worldwide, Koons’ first retrospective was held at the Whitney in 2014. Based on this, you’d think that Koons is pretty high up there in the food chain. So why is the art world still so divided about his merits as an artist? Jeff Koons ‘Gazing Ball (van Gogh Wheatfield with Crows)’ (2015) Oil on canvas, glass and aluminum, 46 x 96 1/8 x 14 3/4 inches, (116.8 x 244.2 x 37.5 cm). © Jeff Koons. Courtesy Gagosian Gallery/ Photo: Tom Powel Imaging. In his current show at Gagosian Gallery, Koons invites the viewer to engage with the Masters of the past: reproductions of Titian, Van Gogh, Manet and others. Each painting has a blue glass gazing ball in front of it, sitting on a painted aluminum shelf. For centuries, gazing balls have been used to decorate gardens. Mystical powers have been attributed to them. In this show, the gazing ball allows the viewer to interact with the paintings, and vice versa: forming the connection between the past and the present. 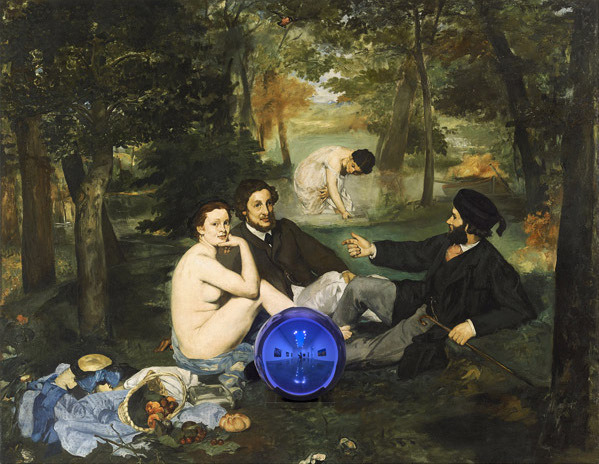 Jeff Koons ‘Gazing Ball (Manet Luncheon on the Grass)’ (2014-2015) Oil on canvas, glass and aluminum, 63 x 81 1/4 x 14 3/4 inches, (160 x 206.4 x 37.5 cm). © Jeff Koons. Courtesy Gagosian Gallery/ Photo: Tom Powel Imaging. The exhibition ‘Gazing Ball Paintings’ is on show until 23 December 2015 at Gagosian Gallery, 522 West 21st Street, New York, NY 10011.